Plymouth based Chay Snowdon is an alt-indie, pop artist who is for fans of; early Kings of Leon, Circa Waves and Catfish and The Bottlemen. 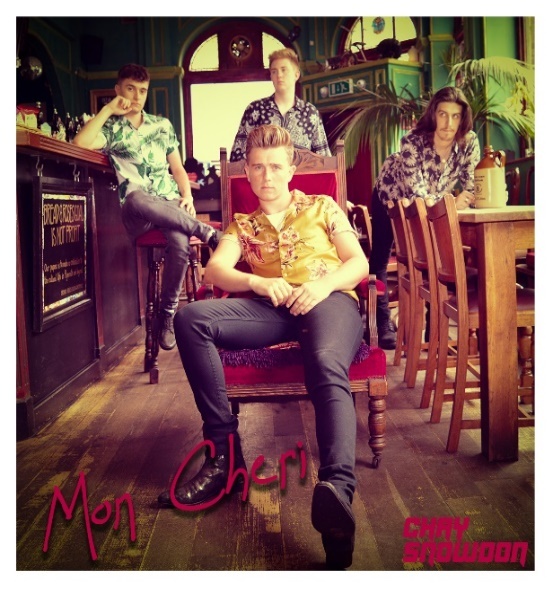 He’s releasing two singles on the 25th Jan.
‘Mon Cheri’ is Chay Snowdon’s new January offering. A fast paced, mosh pit banger that is sure to make you sweat at one of his gigs. The track is heavily influenced by high profile indie and alternative artists and possesses a kick start thrill from start to finish. Whilst ‘Mon Cheri’ is a heavier offering, ‘Sha La La’ strips things right back, a perfect way to conclude the release of the tracks, a real sense of reflection. The lyrics express living fully within the moment, quoted by the band, “living by the ethos of let’s live for tonight and deal with everything else tomorrow”. It’s a song that will make you hold your lighter up high in the crowd whilst the room sways along! The Bristol based band (Liam Roberts on lead guitar, George Roach on bass, Ed Fox on drums and Chay Snowdon providing vocals and rhythm guitar) have already made their mark on the independent music scene and 2019 is going to be THEIR year! Having completed two UK tours, sold out a show in Bristol, supported The Sherlocks, JUDAS, VANT, The Snuts, Glass Caves & Oddity Road and performed at both Camden Rocks and Looe Music Festival, these two singles couldn’t have come at a better time for festival organisers and promoters to get a feel for the quality sound that Chay and his band produce.